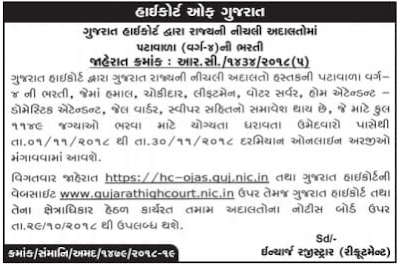 The High Court of Gujarat Issued an advertisement for recruitment for 1149 Hamal, Chowkidar, Liftman & Peon Posts.This is a great chance for who are eagerly waiting and interested candidates for High Court of Gujarat Class-4 Jobs 2018.Interested And Eligible candidates can apply online from 01-11-2018 to 30-11-2018.Candidate is advised to visit official notification before applying for this post.To know More About this recruitment read details in below given official notification. How to Apply High Court of Gujarat Recruitment 2018? Advised to read Advertisement carefully all steps. 0 Comments "High Court of Gujarat Recruitment for 1149 Hamal, Chowkidar, Liftman & Peon Posts 2018 "